Deer hunting Season is August through December. All whitetail deer hunts include licenses, lodging, meals, one-on-one guide service, dressing and caping. We can also arrange for processing and shipping of meat and taxidermy services. While whitetail hunting is a dynamic and challenging hobby, it can also be one of the most elusive to take up for those with no past experience. Historically, hunting is a skillset that people often learn within their own families or communities. They grow in a culture that teaches them about weapons, safety, gear, tracking, trophy/meat processing and more. While this avenue helps preserve traditions and bring up the next generation of sportsmen, what about those who are interested in the concept of hunting but have had no education or exposure in their lives? How can they learn more about hunting firsthand and discover if this hobby is really right for them? If you are an adult who would like to learn how to hunt whitetail deer, the team at Oak Creek Whitetail Ranch can help. Known as one of the places for the best guided deer hunts, this family-friendly destination will help you discover the excitement of whitetail hunts while helping you develop the foundation for a safe, knowledgeable hunter. First and foremost, you want your first hunting trip to be successful so that you have the complete experience. The preserve setting at Oak Creek Whitetail Ranch, as well as their focus on healthy ecology and conservation, creates a thriving population of record-setting whitetails and elk. Holding most of the top SCI records, this ranch will give you not only the best opportunities for successful hunts, but also the specimens that make the most impressive trophies. Beyond the deer themselves, the guides at Oak Creek Whitetail Ranch can teach you about the fundamentals of safe hunting, the best practices for success, and help you discover if this hobby is something you want to embrace. Their passion for their work is evident, and from the hunts themselves to the delicious food and comfortable accommodations, they offer an ideal place for novice hunters to get started. If you would like to lean more about their affordable trophy whitetail hunts, contact our team today at 573-943-6644 and schedule your first experience that will create memories and skills that last a lifetime. 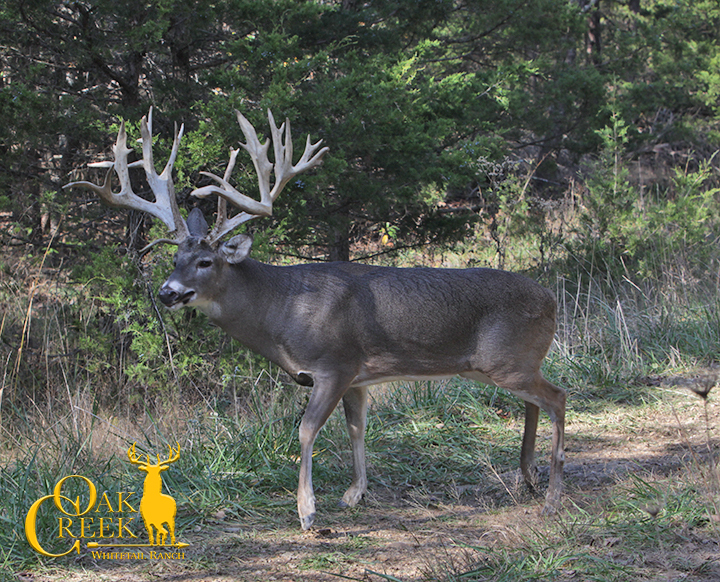 At Oak Creek, we have both free range and preserve hunts. If you would like, give us a call @ 573-943-6644. We would love to answer any questions you might have. Hello, I stopped at your booth at the woc convention in Vegas, and was wondering if you had any openings for 2 for the 2018 season? If so what dates. Yes, we still have two openings for the 2018 season in several dates. Can you give me a call at 573-943-6644 and we can get your dates picked out? Or if you would like me to call you just leave your number and I will call you back.